BYZANTINE EMPIRE. Justin II, with Sophia. AD. 565-578. Æ Follis. PCW-B854-BYZANTINE EMPIRE. Justin II, with Sophia. AD. 565-578. Æ Follis (12.78 gm; 26 mm). 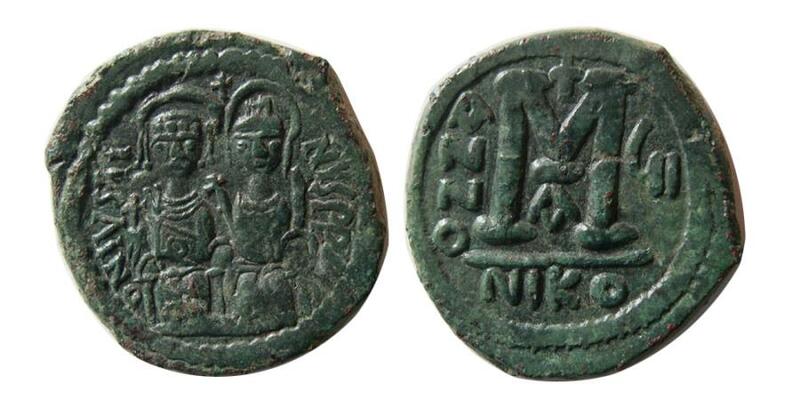 Nicomedia mint, struck AD. 570-571. D N IVSTINIANVS PP AVG - Justin and Sophia seated facing on double throne / Large M with cross above, ANNO to left, GI right, B below, NIKO in exe. SB 369; DOC 96b. Well struck on a nice full flan. Nice dark original green patina. Choice EF.